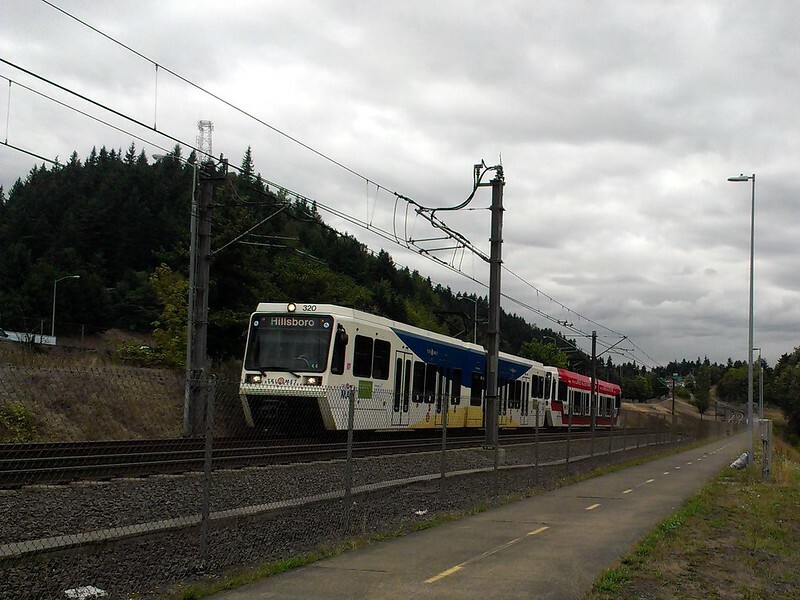 A MAX light rail train passes through Gateway Green. I-205 path in foreground, Rocky Butte in background. Mount Hood would be in the background, if it were clear. It seemed natural to head towards Rocky Butte, since it’s one of my favorite spots in Portland and I hadn’t been up there in awhile. I also didn’t recall if I had ever ridden the Crested Butte up there, so what better time to check it out? (Turns out that I did go up there in March, but whatever. )* Yeah, the view wouldn’t be as great as on a clear day due to cloud cover, but it would still be fun. The steep access road and air beacon in background. The Crested Butte proved herself a capable climber. Even though the geometry is sooooo relaxed with 68 degree angles and a 44 inch wheelbase, the low gear is appropriately low. I even managed the short but steep (maybe 10-12%) gravel surface road to the very top, something I don’t think I ever tried. Here’s to low gears and wide tires! From there I went to the no-mans land just east of Rocky Butte, the island of territory between the I-205 and I-84 interchange. For years, this area had no name, but now it’s called Gateway Green because of the project that hopes to transform it. 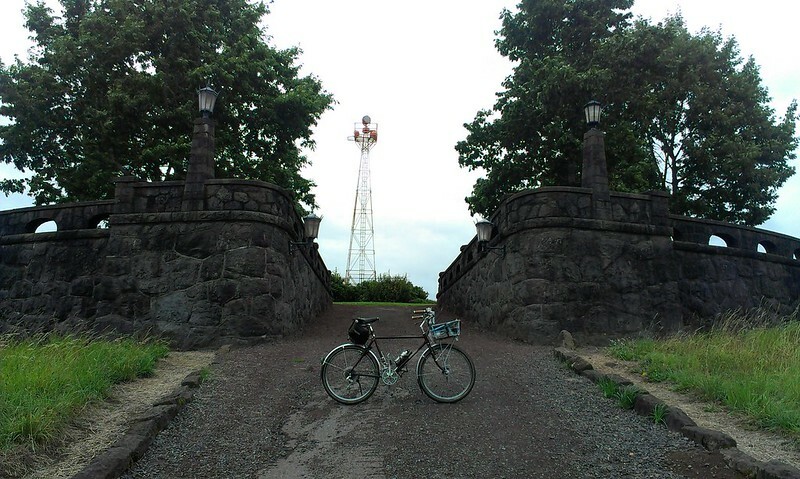 The proponents of Gateway Green want to make this demilitarized zone into a park, complete with extra through bike paths (the I-205 Path already goes through it, providing the only way in), a mountain bike park, and eventually new bridges over the freeways to connect to the bike network. As it is today, there is no east-west routes for bikes (or cars for that matter) between NE Prescott Street and NE Halsey Street, a distance of almost two miles, the biggest gap in the eastside. But I’m all for Gateway Green. It’s a heck of a lot of dead space that can’t be used for anything else. 38 acres of dead space, to be exact. Of course nothing is completely “dead”, so I decided to take a closer look. 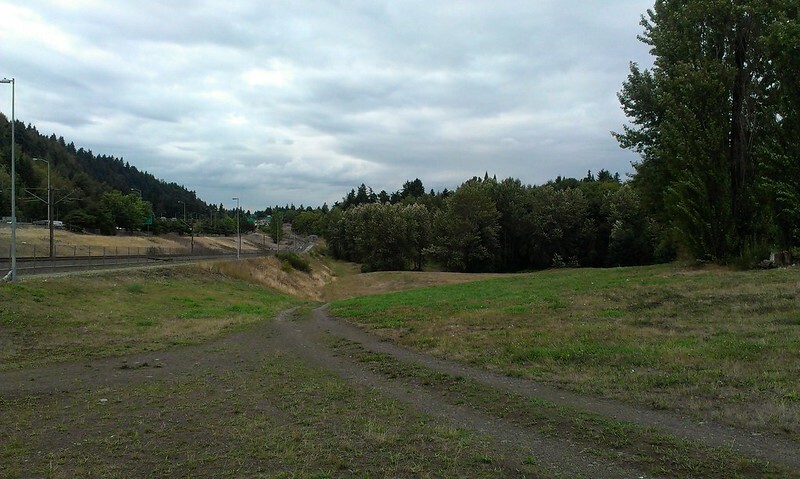 Currently, there are only two routes through Gateway Green: the main paved path (I-205) and an unpaved ODOT (Oregon Dept. of Transportation) route. Technically, any trekking offthe I-205 Path is considered “trespassing” (as the signs tell you many of times), but I doubt that ODOT ever really cared. ** With little fear of reprisals, I took the road less traveled. 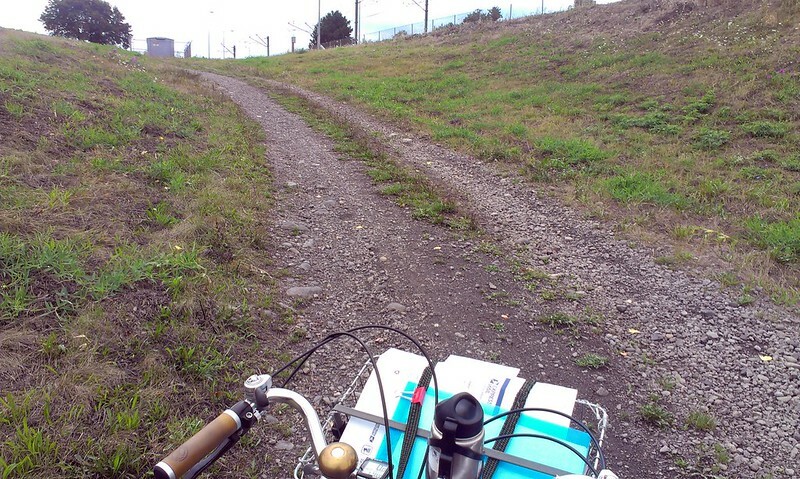 The unpaved service road is pretty nice, and the scenery surrounding it is surprisingly bucolic. (If you can ignore the traffic noise, which because most of the “Green” is below freeway grade, isn’t that bad.) The landscape was basically created by fill from freeway construction, mostly grassland with more forested land on the eastern edge. Of course there are the occasional reminders that you are in “unwanted” territory: stray shopping carts, garbage, evidence of campfires, a bike in the woods, and even a tent at the top of the hill, unhidden from highway view. Marginal land attracts those who are in the margins, so to speak. I haven’t heard of any real incidents down here, as I figured that most folks who hang out or live down here just want a spot where they won’t get messed with. Still, I wouldn’t really want to poke around the corners after dark. Anyways, it was a quick expedition, as the access road is nary a mile long, and Gateway Green is a long and narrow strip of land. There looks to be some very primitive trails in the woods, and someone has built a small trail with jumps on it. But for right now, that’s all there is to Gateway Green. I’m looking forward to the day that there’s something more here, and especially to the day when there will be good east-west access in the region. Can I hope for some more trails on the sides of Rocky Butte while we are at it? 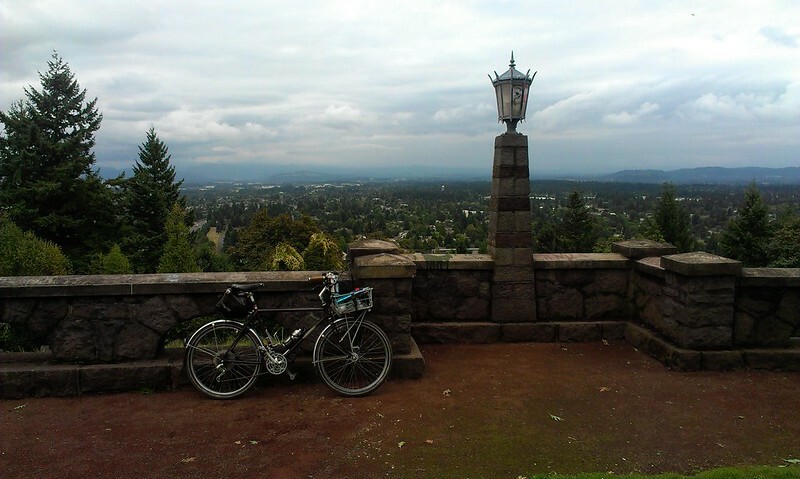 The ride up and down on the one road is fine, but it would be nice to have some variety like Mount Tabor and Powell Butte. 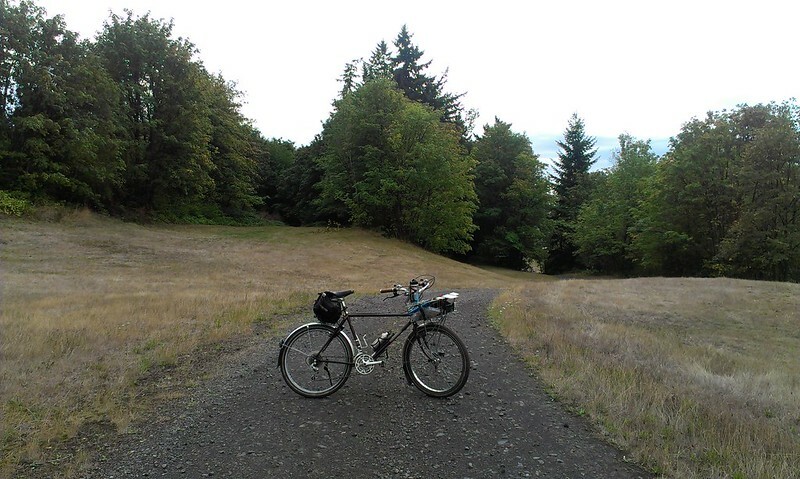 *Now going through my photos I realize I haven’t ridden the XO-3 up to Rocky Butte. This needs to be rectified. **And there’s less impetus for them to care, as they have pretty much signed off on Gateway Green.